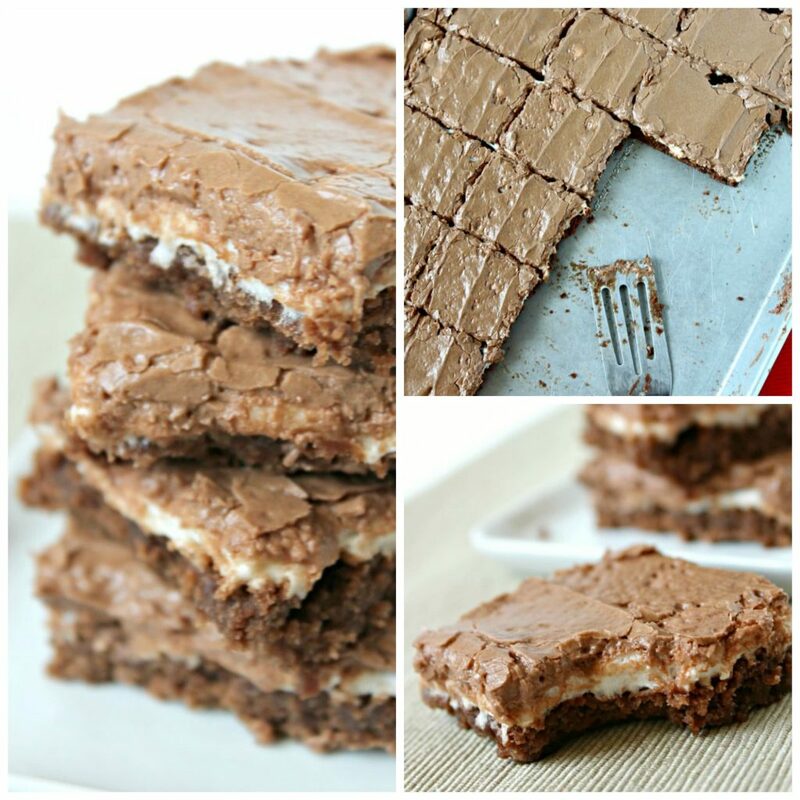 Mom's Famous Chocolate Marshmallow Brownies are gooey goodness. 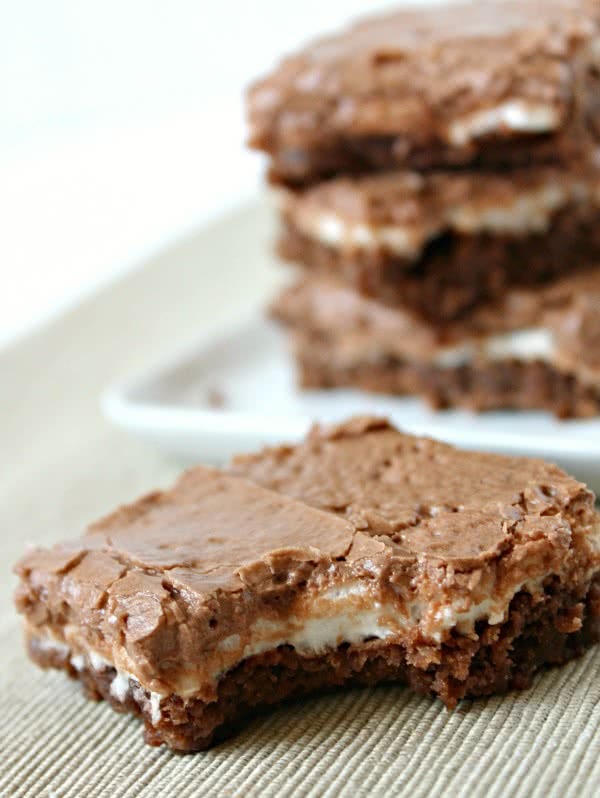 The melted marshmallows on a chocolate base, topped with creamy homemade frosting, is probably the world's best combo. I wish these pictures were scented because they smell almost as good as they taste. The chocolatey goodness with a layer of melted marshmallows will bring your tastebuds to life. 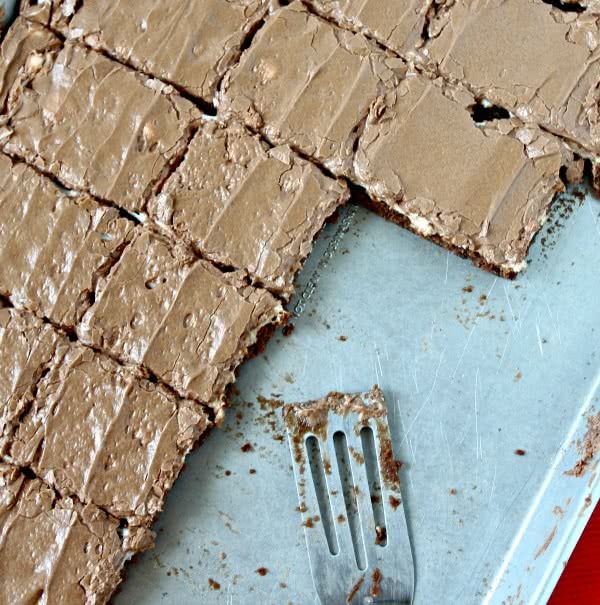 These brownies are so easy to make, and you are going to love them. These soft chewy brownies are topped with a decadent chocolate frosting. Below we take you step by step, how to make the best chocolate frosting. It’s easy, delicious and is made within a matter of minutes. I know that we have already shared this recipe on our blog, but they are so good, they deserve a second post. Besides, I think that when we first posted them, our blog was just starting out and probably our only reader was our mom. I had to put “Famous” in the title because our mom is seriously famous for these amazing brownies. When we were growing up, our mom would make these brownies all the time, but it was usually for someone’s birthday, for a sick friend, or a neighbor that just had a new baby. When mom did make a pan just for our family, it was always a special treat. And we could eat the whole pan in a matter of hours. I now make these brownies quite a bit because they are easy and it makes a TON so they are perfect to share with neighbors, or take to a potluck party. Or eat the whole pan if you feel like it. I won’t judge you. Step 1: In a medium size bowl, soften margarine and blend in the sugar and cocoa until well combined. Step 2: Add the eggs to the mixture one at a time, and blend until smooth. Step 3: Add flour, salt and vanilla and continue to combine until everything is fully mixed. Step 4: Grease a cookie sheet with non stick cooking spray. Pour the brownie batter into the pan and spread out with a greased spoon or knife. Step 5: Bake for 22-25 minutes at 350 degrees. Step 6: Remove from oven and spread an entire bag of mini marshmallows over the hot brownies. Be sure to cover up as much brownies as you can. Place the brownies back in the oven for 3 minutes. Do not cook for longer than 3 minutes or your marshmallows will burn and be crunchy. You want your marshmallows to be soft and not chewy. Step 7: Let brownies cool completely before frosting. Step 8: Cover the brownies with chocolate frosting. For a homemade chocolate frosting recipe, read below. We have just the right amount of all the ingredients to make your frosting perfect. Homemade frosting can be a little tricky. I could never get it right at first, then I came across this recipe, and ever since then, I haven’t had a problem with my frosting. It comes out perfect every time! Here is how you make it. The key is to follow the ingredients measurements perfectly and in the right order. It’s also important your butter is at the right consistency. Step 1: Soften your butter. This does not mean melt. This means room temperature. If you are in a hurry, and just got the butter out of the fridge, cut it into centimeter width slices and microwave for 15 seconds. It’s okay if there is a little bit of melted butter at the bottom of the bowl, but you do not want to melt all of the butter or your frosting will be thin and end up looking like more of a glaze than frosting. Step 2: Add the milk, vanilla, cocoa and powdered sugar to the bowl. Add them one at a time and continue to mix with a hand mixer. We find that the powdered sugar and cocoa combines best without lumps when you use a hand mixer. You could also use a whisk, but to save yourself some time and an arm workout, we definitely recommend a hand mixer. If the frosting isn’t to your desired thickness, you can also add a little more powdered sugar. Remember that you can always add more, but you can’t always take it back. You will want to start small with the powdered sugar and add a little at a time. Step 3: Mix until the frosting is smooth. Step 4: Spread over the cooled marshmallow brownies. It’s important to let the brownies cool before adding the frosting or else the frosting will melt and become more of a glaze. Soften margarine and blend in sugar and cocoa. Beat together and add 4 eggs, one at a time, mixing after each one. Add flour, salt and vanilla and mix well. Spread on large (10x15x1 inch) greased cookie sheet. Remove from oven and cover entire top with 1 package of miniature marshmallows. Return to oven for 3 minutes, until marshmallows are soft and puffy. Cool and frost with chocolate frosting. oh my goodness. these look divine. yum! They look yummy! Thanks for sharing, I'm so going to try this recipe. I met two of you sisters at SNAP & I'm popping by to see you. Wow, this is such a great blog! I'd love to try some of your recipes. 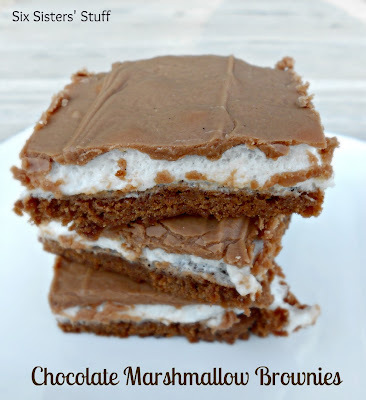 Brownies at any time of day work for me:-) And these ones with marshmallow and frosting are going to the top of my try list!!! Love! These brownies sound (and look!) amazing!!!!! They look like heaven!I'll really have to try them. These were SO GOOD! Probably the best brownie I have ever had. I?m ecstatic I discovered your website and blogs. Is it made with self rising flour or all Purpose? These are seriously delicious! The base is perfect, the marshmellows the perfect center, delicious icing - what's not to love! 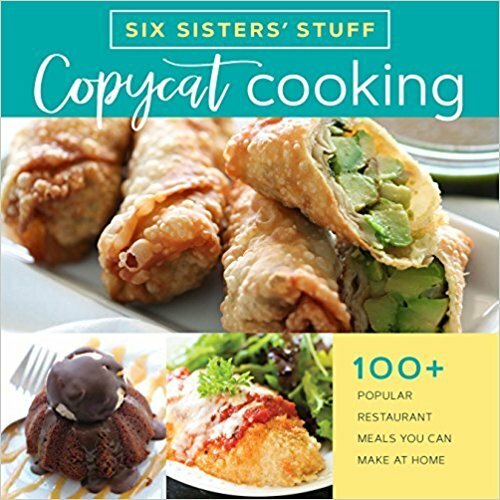 I'm so excited to have found your site - what great recipes you have! Thanks so much for sharing them. In the oven now. I love the ingredients are basic ingredients that I normally have on hand. No trip to the store. Looking yummy! These were delicious! My kids gobbled them up and asked that I make them again, thanks for the great recipe!!! I just made these and oh my god they are amazing! Will definitely make them again! I have made these brownies multiple times for parties and there are never any left. They are amazing. I use the colored mini marshmallows and drizzle the chocolate frosting (made a little thinner) just to give it a more colorful/fun look for the kids. Absolutely the best brownie ever! Thank you! When you bake the brownies, 350 degrees Celsius or Fahrenheit?? BTW love you ? This may be a dumb question but you store them in the fridge or just leave them out? Hi Debbie. These will freeze fine in an airtight container. I made these for a Church function and they were a hit. I only cooked the brownies for 18 minutes and they turned out perfect. And I didn't have a mixer so everything was hand mixed. Delicious! Step 3 is missing? Making these now. Not sure if all steps are here. Sorry about that. None of the steps are missing. There is just an extra space in there and it bumped down the directions. We updated the problem and now it is fixed. Thanks for the heads up. What size cookie sheet is best to use? I have several sizes. Approximately 17 1/2 x 12 1/2 or 18 x 13 inches. Do you buy unsweetened cocoa or sweetened? We use Hershey's unsweetened cocoa. I only have a 13 x 9 pan. Would that work ok? I made them in a 13 X 9 panand they took my oven about 30 minutes to bake. They turned out great! These look and tasted fantastic! My only issue is my icing seems a tad runny. Is this the norm? Would it help if I put them in the fridge? Just add a little more powdered sugar until you get the right consistency. Be sure your butter or margarine is not melted, just softened to room temp. Hey cyd I was wondering what is your mothers chocolate frosting recipe? This is basically the recipe for the frosting - 1 stick margarine or butter (1/2 cup), softened to room temp 2 tablespoons milk 1 teaspoon vanilla 3 tablespoons of cocoa 3 cups of powdered sugar Beat above ingredients all together with a hand mixer. If the frosting is too runny add more powdered sugar. If it's too thick add a little more milk. If you want it to be a darker chocolate taste and color, then add in another 1/2 tablespoon of cocoa. Hope this helps. Let me know if you have any other questions. Or can you double the recipe for 13x9? I made these today and they are DELICIOUS! Super easy recipe. 5 stars! I only have 11x17 baking sheets. Will this recipe work as is? You should be fine, just be sure the brownies are done. Is the butter room temp.....or is it melted? The butter is at room temperature. Hello - do you use salted or unsalted butter? We have used both, but usually buy salted butter.